EDITOR’S NOTE: As the PP Blog was researching matters pertaining to the Zeek Rewards MLM “program” and preparing the post below for publication, it encountered a subdomain of the ZeekRewards.com website styled “zeeksupport.” A page on the subdomain purports to identify 16 Zeek “employees,” although is was unclear whether the workers received a wage or salary or were independent contractors. Included among the “employees” listed were Terralynn Hoy and Catherine Parker, both of whom were affiliated with AdSurfDaily, which the U.S. Secret Service alleged was a Ponzi scheme that had gathered at least $110 million. Hoy, at least, also was affiliated with an ASD knockoff known as AdViewGlobal. In April, federal prosecutors in the District of Columbia said they’d tied ASD President Andy Bowdoin to AdViewGlobal. Bowdoin, 77, pleaded guilty to wire fraud last month after being charged criminally in 2010 for his role in the ASD Ponzi scheme. As part of a plea agreement, Bowdoin has been banned from MLM, Internet programs and mass marketing. 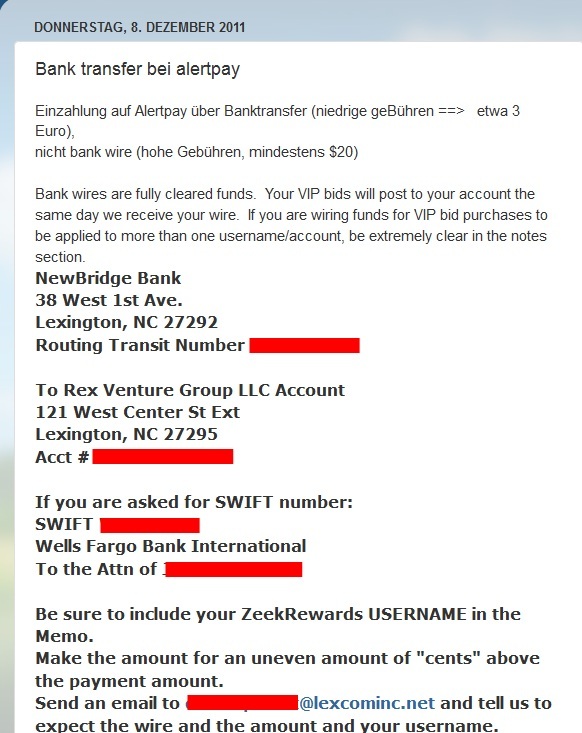 Although the story below does not report on the Zeek claims that Hoy and Parker are Zeek employees, a link on the Zeek subdomain leads to a page in which “Catherine Parker” is responding to Zeek customer-service issues, including one titled, “TO BE PAID FOR OUTSTANDING AUCTION WINNINGS, POST HERE.” Within the customer-service thread is a post from an individual who claimed to have won an April 12, 2012, Zeekler auction for $100 in U.S. cash with a winning bid of $16.28 — but never received his money. Other posters also claimed not to have been paid . . .
Zeek announced suddenly last week that it was ending its relationship with NewBridge. It also announced it was ending its relationship with BB&T, a second bank based in North Carolina. Zeek plants the seed that affiliates can earn a return of between 1 percent and 2 percent a day, but the “program” insists it is not offering an investment opportunity. The post provides a glimpse into how U.S. banks could come into possession of funds tainted by fraud as the funds circulate between and among various HYIP programs advertised online. Research by the PP Blog shows that NewBridge also was one of the banks that handled the business of a bizarre MLM “program” known as “Narc That Car” that effectively collapsed in 2010 after the Better Business Bureau raised pyramid-scheme concerns and American television stations and investigative reporters turned their sights on Narc. How Narc, a Texas-based company that used at least two names and at least two banks when issuing checks to members, ended up using NewBridge in North Carolina as one of its banks is unclear. Narc issued checks under the names of Narc Technologies Inc. and National Automotive Record Centre Inc. The entity later became known by a third name: Crowd Sourcing International. Like Zeek, Narc relied on a company known as USHBB Inc. to produce video sales pitches for its opportunity. USHBB is based in Indianapolis. Among its listed officers is OH Brown of Mount Pleasant, S.C. Brown hosted this May 2012 call for the Zeek “program” and also is listed on Zeek’s website as a Zeek “employee” who simultaneously holds the title “Official Rep.” Whether Brown receives compensation from Zeek while also serving as the vice president of USHBB is unclear. On March 15, 2010, the PP Blog published a story that reported that a video USHBB produced for the Narc “program” asserted that some affiliates were earning more money than the President of the United States. As part of its reporting on Narc, the PP Blog visited a USHBB website in 2010 that claimed the company had done promotional work for MLM teams and companies such as Ad Surf Daily, AdGateWorld, BizAdSplash, Ad-ventures4U, TVI Express and Global Verge/Buzzirk Mobile. Virtually all of the enterprises listed were associated with get-rich-quick schemes or HYIP autosurfs. Some of the “programs” later went missing from the web or were accused of fraud. Frederick Mann of JSS Tripler/JustBeenPaid was a promoter of both AdSurfDaily and Ad-ventures4U, according to records. Clarence Busby, a onetime business partner of ASD’s Andy Bowdoin, was the purported chief consultant and operator of BizAdSplash, an autosurf that vanished mysteriously in 2010. Erma Seabaugh, ASD’s purported “Web Room Lady,” also was affiliated with Ad-ventures4U. Seabaugh is named in a complaint as the owner of a bank account targeted for forfeiture in the ASD Ponzi case by the U.S. Secret Service. On March 2, 2010, the PP Blog reported that a Narc affiliate known as “Jah” was seeking to drive business to Narc by producing his own videos and posting them on YouTube. “Jah’s” videos featured check-waving as a form of social proof that Narc “paid.” One of the videos, which later was removed, showed a Narc check drawn on NewBridge. Another “Jah” video that still appears online shows that Narc also had an account at a second bank. “Jah” compared repping for Narc to working for the U.S. Census Bureau. Some of “Jah’s” check-waving videos later were hidden from public view. Jah, however, was not the sole Narc affiliate to produce check-waving videos in which checks from NewBridge were displayed. Though Narc appears to be long gone, the PP Blog observed a video today on YouTube in which the name of NewBridge flashed on the screen. Zeek has not provided specifics about why it ended its relationship with NewBridge. SolidTrustPay is a Canada-based payment processor that is handling business for both Zeek and JSS Tripler/JustBeenPaid. FYI, SolidTrustPay also handled TVI Express scam, until STP dropped them in 2011. Seems most ASD members migrated over to Zeek, doesn’t it? We’re just finding more and more of them. T, LeMont Silver, shown as “employee” on Zeek’s GetSatisfaction board, is a OneX member. He claims to be a pastor. (Jean) Marie Young Cain’s website jeanmarieyoungcain.com has ZeekRewards referral link, and “FTC Compliance disclaimer”. She apparently had multiple aliases, including “kahindle”. I think these “employees” are outside “volunteers”. I took one look at that list of Zeek “employees” and my eyebrows nearly hit my hairline from one name. So she’s not just someone pushing it, but an official company representative, eh? How slimy. K. Chang: T, LeMont Silver, shown as “employee” on Zeek’s GetSatisfaction board, is a OneX member. He claims to be a pastor. I watched part of T. LeMont Silver’s OneX pitch. Among the claims was that OneX positions being given away were worth $5,000. For newer readers, federal prosecutors said in April 2012 that OneX was a “fraudulent scheme” and “pyramid” that was recycling money in AdSurfDaily-like fashion. ASD’s Andy Bowdoin, who has pleaded guilty to wire fraud in the ASD Ponzi case, claimed in October 2011 that former ASD members could make $99,000 “very quickly” in OneX and that he intended to use the OneX “program” to pay for his defense in the ASD-related criminal case against him. Part of the probe featured surveillance of a Dumpster. Birds of a feather, flock together, heh? K. Chang: Birds of a feather, flock together, heh? I’ve been busier than a one armed paper hanger with the rickets lately, thank you to Patrick and Oz for keeping me up to date. A few days ago there was a very significant post on one of Troy Dooly’s older Zeek update posts. I could buy the “going paperless” story if that was all it was but they “clawed back” every outstanding check the company issued. No legitimate buisness does that and now shady internet payment processors are the only way to move money. Now we hear of legal issues in Montana (FHTM anyone?) and we hear of them on Troy’s website. This isn’t a line in the sand or anything like that but it is a point of demarcation. How red does a flag need to be before Troy will turn down a speaking fee? I called the office of the Montana Commissioner of Securities (Monica Lindeen) on Monday to see if I could get a clarification on why Zeek’s name is surfacing in the context of regs in the state. Haven’t received a call back. If I develop any info on this, I’ll report on it. I think it can be said fairly that Zeek is aware of Montana — but is Montana aware of Zeek and conveying any concerns it may have to Zeek? As you note, Zeek itself has raised Montana’s name. I doubt that happened for no reason at all. It’s right at the 18 minute mark. Had to FF through and back a few times to find it. As they just moved all banking out of North Carolina, this is a VERY interesting development. Someone download this and save it before it disappears. Also note on the 5/31 call with Daryl Douglas at the 12:00 mark, DD says that he’s never heard of a sinle person not receiving their items from the penny auction, yet there are hundreds of people with open tickets that have gone unanswered and many are posting publicly on the Zeek support page. I also asked several affiliates and my guess is 80% of the affiliates do not even know about the Zeek forum. When word gets out, there will be lots of people posting! Now this is stunning to me to hear that 80% of the Zeek people do not know about the Zeek forum. How in the world could they not know? Every program likes this promotes the living daylights out of their forum. It is the only way they can control what is said and keep people in-line. It’s obvious they made a mistake opening up a forum where people could post how they really feel. If they weren’t having so many problems as a result of amateur business mistakes, and as a result of the complexity in trying to disguise a ponzi as something else, they wouldn’t have all these issues. You can also go on to ZeekRewardsNews blog and search for “zeeksupport” you won’t get any hits. What is truly going to be interesting is when all the members start turning on each other and the mods start the threats of banning people for not remaining positive, bad-mouthing the program, etc., etc.. From the sound of things, it won’t be long until this does start happening. This is going to die faster than I originally thought. I thought they would make it to at least September before the program started to unravel, but now they will be lucky to survive the month of June with all of their problems. This is almost like watching the sinking of the Titanic from the lifeboats. You know it is going to sink, you just don’t how long it will take before it does. Stamping out dissent is standard cult / ideology tactic, as sort of “purity test”. I am just trying to get further information about the bid purchasing being put on hold in Montana.. If accurate this would mean no new affiliates can be enrolled in Montana AND no new bids can be purchased there as well. It will be interesting to see how Troy and Dawn spin this. Sidenote: O H Brown resurfaces as uploader of video for Offer Hubb, a new “venture” by Craddock and Disner. This is probably the Zeek 2.0 they were referring to.